E1 and I just returned from a field trip. This was not just any field trip – this was the epic, end of elementary school overnight trip. We spent 4 days touring through Old Quebec City with over 70 Grade 7s and 8s. The weather was perfect. The kids were great. The food was really good. But you know what else? It takes 12 hours in a bus to get to Quebec from where we live. That is a LONG time, even for a group of 12-14 year olds. Thankfully, my good friends over at Raincoast Bookshad sent me a selection of Lonely Planet books that helped keep all of us entertained. Brain Teasers was literally a life saver. When the tour guide asked for riddles, E1 had a whole slew at the ready (pages 38-39, if you’re curious). 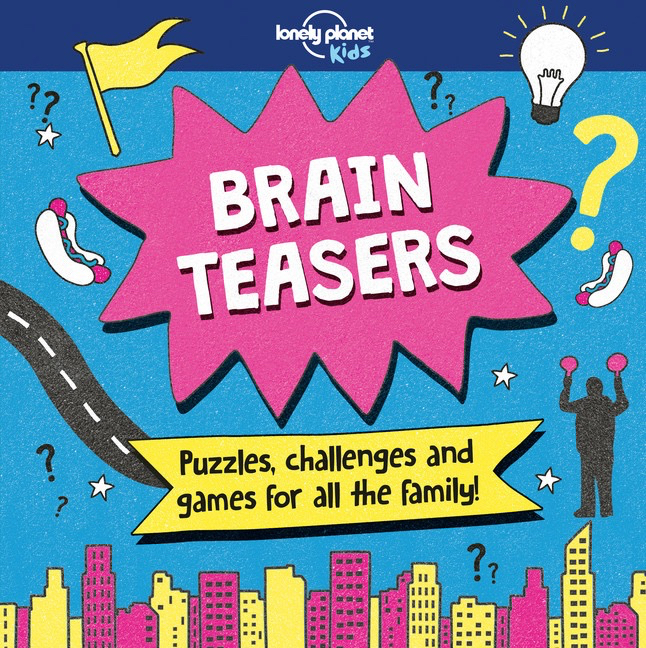 Crosswords, word searches, logic puzzles, and a host of other no-accessories-required games to help pass the hours. Hands up if you remember the Choose Your Own Adventure Books? 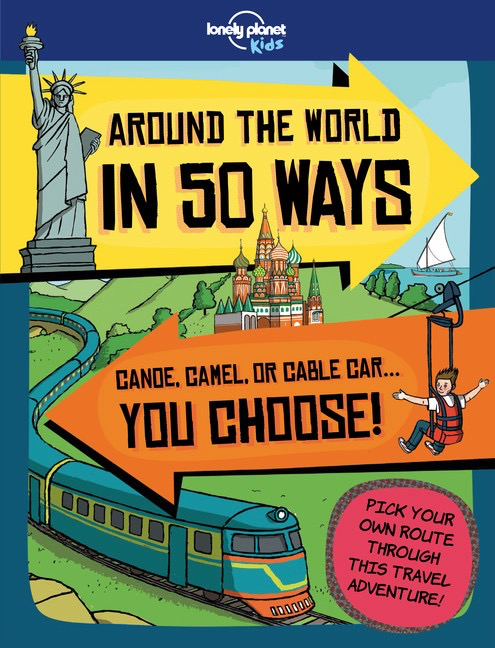 Around the World in 50 Ways is the same concept, except a whole lot funner. Yes, I can use ‘funner’ if I want – it’s my blog. Bright and colourful illustrations fill every page. After reading a quick and informative blurb, the reader chooses between three options and then forges their own path across the globe. I would say this is best suited for the 8-11 year old set. So maybe you’re not quite up to the crazy around the world adventures that you see some families taking. 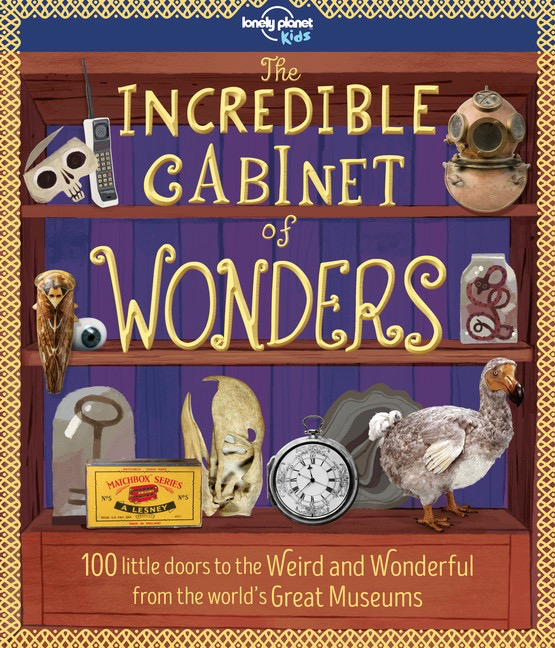 You can still explore some of the world’s greatest museums with The Incredible Cabinet of Wonders Twelve different cabinets hold a total of 100 little doors to open. Behind each one, a unique treasure from around the world. All the excitement of global travel without having to renew your kids’ passports. That’s a Win/Win right there. Lonely Planet from Raincoast Books Giveaway Time! You can win one of these fantastic books from Lonely Planet Kids (distributed by Raincoast Books in Canada). Enter using the Rafflecopter form below. Odds of winning will depend on the number of eligible entries received. Value of prize will depend on the item chosen. Open to residents of Canada only. Not responsible for lost or misdirected entries. Contest closes June 11, 2018 11:59 pm ET Good luck! 20 Responses to "Summer Road Trip Ready #ExploreEveryDay"
Going to the family cottage for 2 weeks. We will hopefully get out camping a bit but we have no huge plans this year! No plans at all this year, just staying around home! We have nothing planned for the summer holidays,just going to stay around home! We a trip to Niagara Falls planned in July and a trip to Niagara-on-the-lake & back to Niagara Falls in August. We don't have a big trip planned, but we'll do lots of outings to local parks and beaches! I have no trips planned for this summer - lots of chores to do around the yard, and maybe a couple visits to the nearby beach. We are just starting to plan a trip to the badlands. No big trips. Just going to do a small province road trip. Booked air flight for 3 times zones with daughter and grand kids, then 7days travelling adventures, ice and fire, hot water and glaciers, need these books. And some relatives who still live there. We have no big trips planned for the holidays this year. No big pans for this summer yet. Hoping to visit my son out west this summer! No big trips, we are doing lots of day trips instead. I do not have nay big trips planned for the summer holidays. I am just planning a couple of weekend road trips but my husband is taking my sons to Nova Scotia. It's the first time he's travelled alone with our kids so it's a big deal for us and I'm looking forward to some alone time, just me and the pup.